1 cup Wild RiceSimmered with 2 cups water, 1/2 tsp. salt and 1 Tbsp. unsalted butter for about one hour or until grains are softened but not bursting. 2 cups PecansBreak them in pieces as you are measuring them. 1 For ease of preparation on Thanksgiving Day, I usually try to prepare the wild rice the day before. However, it is an easy process. One Thanksgiving I had forgotten to do this the day before, so I started the rice before leaving for church in the morning. When I returned home, I found I had forgotten to turn off the heat under the rice and was very THANKFUL the rice was no worse for the lengthy cooking. 3 Melt 4 Tbsp. of unsalted butter in a large saute pan over medium heat. Let the butter melt. 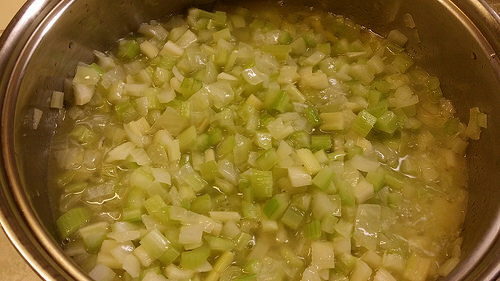 Add both the onions and celery. Let them saute just until they are somewhat transluscent, but preferably not browned. 5 Add the bouillion cubes and two cups of water. 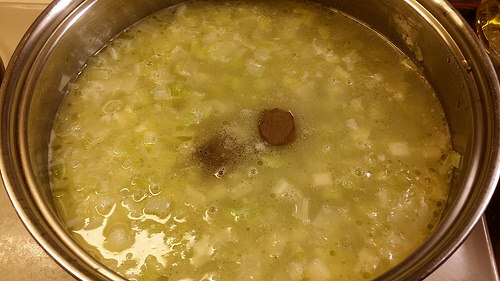 Let the mixture continue to simmer, just until the bouillion cubes are dissolved into the mixture. Turn the heat off. 6 Preheat the oven to 350 degrees. 7 Pour the bread cubes into a very large bowl. Pour on the cooked mixture and mix gently but very thoroughly. Add the cooked wild rice. Add the Bell's Seasoning, the eggs and pecans, and continue to mix gently. As needed, add water to obtain a consistency you like. 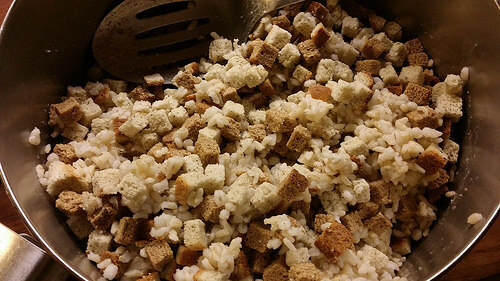 I tend to like our stuffing somewhat moist, so I add water until the mixture is moist but not at all "drippy." This is a little difficult to explain, but I trust in your ability to figure out the consistency you prefer. 8 Grease with butter a very large oven-worthy dish. Spoon into it the prepared stuffing. Dot with 2 Tbsp. of butter. 9 Bake for 20 to 30 minutes, covered. It should be well-baked, but not too crusty on top. 10 HAPPY THANKSGIVING! 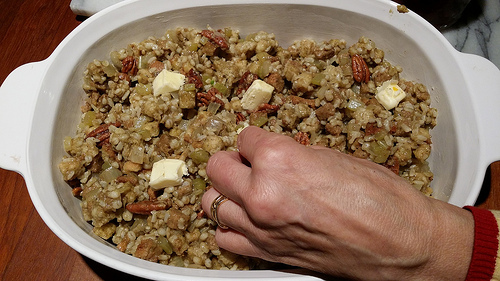 ... and any other occasion calling for a truly wonderful bread stuffing. 11 See the recipe for gravy!